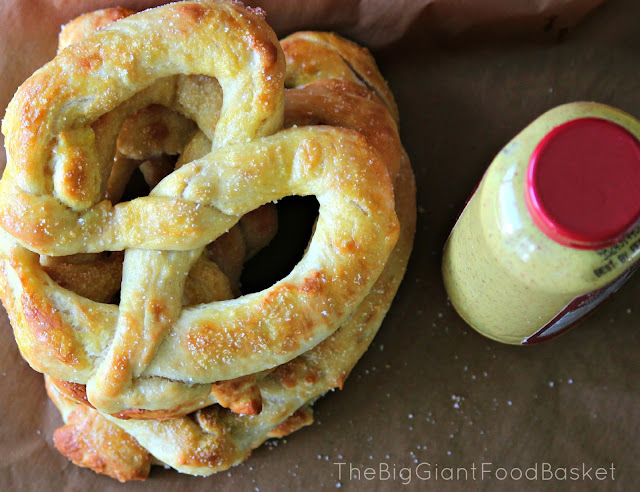 The Big Giant Food Basket: Getcha Homemade Soft Pretzels Here! Getcha Homemade Soft Pretzels Here! Pretzels are the hot foodie item this fall with all of the pretzels buns and pretzel cones and crusts, and why not...pretzels are sooo versatile. And really once you get the hang of it, they are pretty easy to make. 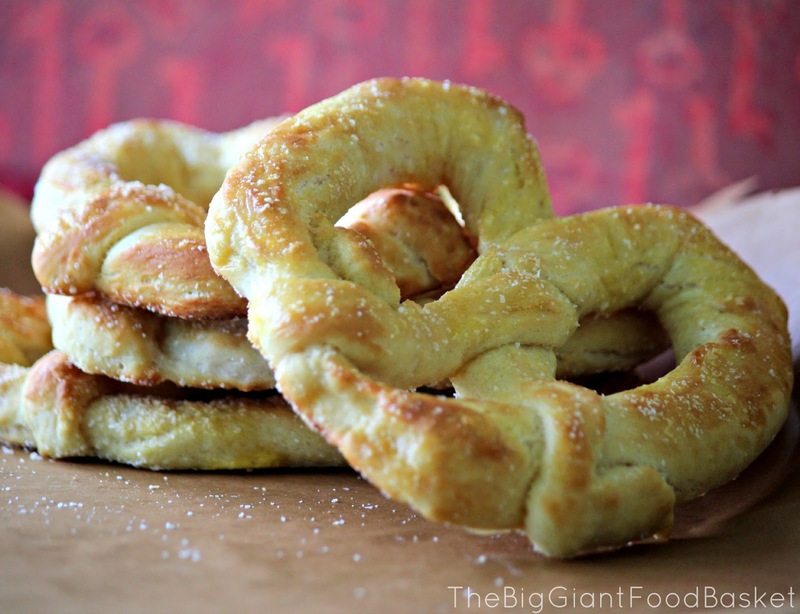 This recipe is from Better Homes and Gardens Fall Baking magazine and yields 8 soft pretzels. In a small saucepan heat milk and 1/4 cup of water along with the sugar. Heat until warm about 110 degrees F. Remove pot from heat and pour into the large bowl of a free standing mixer. Sprinkle in the yeast and let set for about 5 minutes. This will activate the yeast and should begin to foam. Add 2 1/3 cups of flour to the yeast mixture and then using the hook attachment of your mixer, beat on low speed for about 3 minutes. Scrape the sides of the bowl. Then bump the speed up to medium low and beat for another 8 minutes. The dough should begin to pull away from the sides of the bowl. If it doesn't add a little more flour to the mixture.The dough should be slightly sticky. Turn dough out onto a clean surface and knead it for about a minute. Grease a large bowl with cooking spray and then place the dough in it and roll the dough around until it is coasted with the spray. Cover bowl with a clean dish towel and place in a warm spot for about one hour. Punch the dough down and then separate it into 8 equal balls. Roll and stretch each ball until it is about 24 inches in length. I rolled the dough between my hands and then pulled on it every so often just to stretch it out. Lay your 8 ropes of dough out and cover them with clean towel for 10 minutes. Preheat your oven to 450 degrees F and place parchment paper on a large jelly roll pan or cookie sheet. Next pick up one of your ropes holding one end in each hand so the dough looks like the letter "U". Cross the two ends and then twist the ends two times. Bring the ends down to the bottom of the "U" to create your pretzel shape. 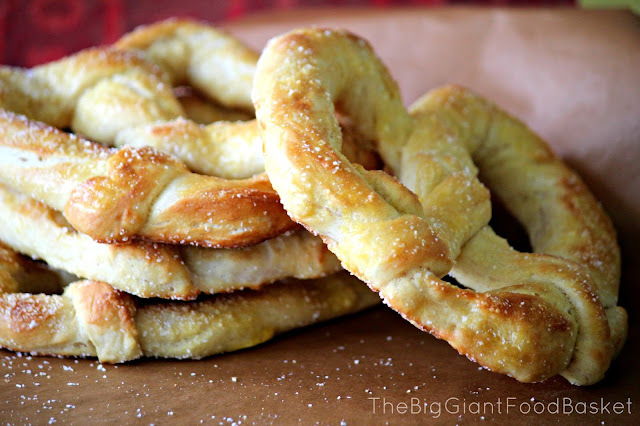 Once all of your pretzels have been twisted, in a bowl slightly larger than your pretzels, add the 3 cups of hot water along with the 1/2 cup of baking soda. Using a slotted spatula or spoon, dip each pretzel into the baking soda and water for 10 seconds and then let it drain on some paper towels. Pat the tops dry with more paper towel. Place your pretzels on the prepared tray. 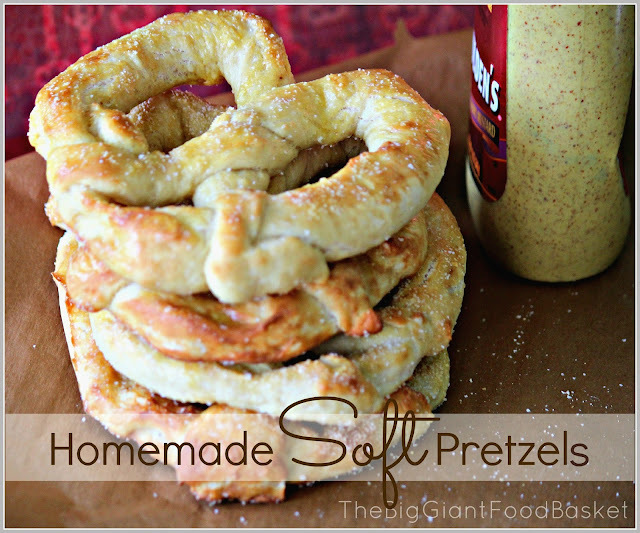 Brush the egg yolk on the tops of the pretzels and sprinkle on your Kosher salt. Bake for about 10 to 12 minutes. Cool on wire rack. PS...if you are wondering where the other four pretzels are you'd have to ask Michael and Gracie! I can almost taste them now. :D So glad you shared this recipe on BeColorful.